Sports card collectors are an eclectic fraternity, including young and old, princes and paupers, drawn from every walk of life. Whether they collect relics from a century ago, or walk into their local shop and pick up the latest Topps product, there is one common denominator that serves to bind them: a favorite player. For some, it is a player they witnessed in their youth for whom they carry fond memories with them throughout their life. For others, it can be a family heirloom passed down as a son collects his father’s favorite player. Historians of the game collect players who were deceased decades before their own birth after reading a story or anecdote, whilst prospectors find a player out of high school to center their collection around with dreams of riding their success from the minor leagues to the Hall of Fame as if it were their own. For prominent New York criminal defense attorney Jeffrey Lichtman, it is a case of finding a colorful connection to baseball’s distant past that resonates with his present. “I’ve been collecting cards probably since the age of about four or five. Some of my favorite childhood memories are of ripping open a pack of baseball cards. Nearly every birthday present or gift I received for special occasions included baseball cards. As I got older, I stopped buying packs but would buy the complete Topps set every year; eventually that stopped and for about a decade I didn’t collect,” Lichtman began, recounting the familiar origin narrative that resonates as familiar with almost every current and former collector. “Suddenly, as a young lawyer, I got the bug again when I came across a T206 card. I had never before collected vintage cards but my love for baseball, baseball cards, history, all came flooding back to me and I’ve been hooked ever since. My first prewar purchase was a Nap Lajoie T206, throwing pose – which I still have,” Lichtman continued, explaining how he reconnected with the hobby upon graduating the Duke University School of Law. He would go on to open his own law firm where he would represent celebrities, such as The Game and Fat Joe, and those with alleged criminal ties, including John A. Gotti, the son of the reputed mob boss. An attorney who collects sports cards is not a rare occurrence, in fact some collectors joke that lawyers in the hobby are ubiquitous as late 1980’s Topps products. However, Lichtman practices law in New York City, an area that for more than a century has been a mecca for both crime and sports. It should therefore come as no surprise that from time-to-time the two worlds have collided – and never in greater fashion than in the case of Harold Homer Chase. “As I got more involved with prewar cards, I started reading about the players. Ty Cobb has always interested me due to his intense nature and, frankly, his bizarre personality. As a criminal lawyer, I tend to be exposed to the bizarre – and criminal, and, thus, my fascination with Hal Chase rarities . One of the first great Yankees (back when they were the Highlanders), he was also one of baseball’s first criminals. Had he not engaged in all sort of nefarious activities he’d surely be in the Hall of Fame, having received more support in the inaugural, 1937 balloting than over 30 eventual Hall of Famers,” Lichtman continued, discussing how his role in criminal justice drew him to a local player with a checkered history of his own. Lichtman is not alone in his praise for Chase, and in fact legendary Yankees slugger Babe Ruth named him his all-time first baseman. Strong praise from a man who for a decade was teammates with Lou Gehrig, the plauyer most universally agreed upon as the greatest ever at the position. Lichtman boasts an impressive collection of Hal Chase rarities drawn from high grade mainstream issues and scarce types. 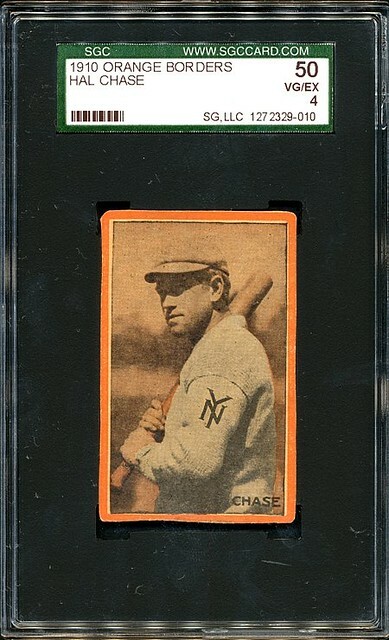 Among them is a possibly unique example of the Boston Garter Sepia issue, featuring a pose of Chase unseen on any other card. Among his other favorites include an Orange Border and a T3 proof featuring a ghost image of Red Kleinow, a cabinet which Lichtman described as ‘bizarre’ as Chase himself. “Of course, having read multiple biographies of Chase, I cringe sometimes thinking how much better things could have worked out for him had he simply had a good lawyer at his side,” Lichtman concluded with a wry smile and a nod to himself. Had he lived in the same era, these two characters would have surely found one another – and the New York media would have devoured the story.